This is a true story of how an artist, football fans, and the big game played a part in introducing a change in our perception of reality. Based on unambiguous empirical evidence obtained from football fans voting in support of their team's SB quest, the events that took place over a twelve year period confirmed what is predetermined in Nature is how effects are caused. In other words, we cannot act in violation of the laws that govern our existence and now we have irrefutable evidence as to what these two laws are via an artist's passion for football and his thirst of knowledge. What has taken place marks the beginning of the end of the assumption that the cause of our physical existence is singular and in turn has launched an exploration of how to apply this knowledge, what its ramifications are, and suggestions of where we go from here. In the second half of the interview, I tell the story of how this all began. This all began with me creating unfinished artwork to be reproduced on a billboard in support of the NY Giants Super Bowl XXI and XXV quest. As history shows, each time I did this they went on to win which in turn caused the effect of me completing the artwork by painting the football silver to reflect the trophy won (see News 12 Video). This legacy was documented and licensed by the NFL as the NY Giants Super Bowl Commemorative Series limited edition prints and posters. The stage was now set to see if this 2-for-2 track record was about luck or was it destiny, i.e., predetermined, what physicists call superdeterminism. 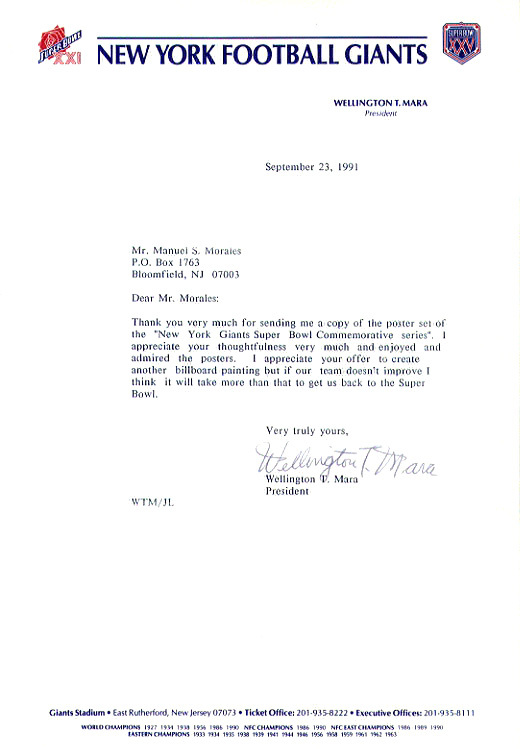 After the second 1991 NFL season had just begun, I had sent a letter and a copy of the 2-for-2 NY Giants Super Bowl Commemorative Series posters to NY Giants owner, the late Wellington Mara. In that letter of congratulations I had also offered to do a third billboard for them sometime in the future as I had done in the past. I later received a letter from Mr. Mara in which he graciously turned away my offer. In retrospect, that letter freed me to do the next billboard painting for those who wanted it. 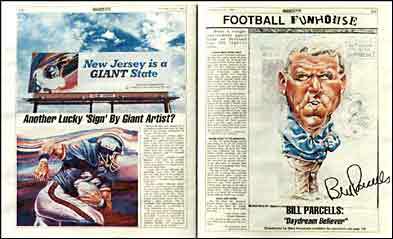 In 1997 Bill Parcels returned to New York City to be the head coach of the NY Jets. After bringing the NY Jets to the AFC Championship game in 1999, my brother Rick suggested to do the 3rd billboard for the NY Jets since Parcells was also the coach for the NY Giants when I did the first two billboards. I conducted an online survey to see if Jets fans would be interested this billboard legacy. To my surprise Jets fans were more interested than the Giants fans. The first year of the Tempt Destiny online experiment began with the 2000 NFL season. At first fans' response ranged from skepticism to tentative curiosity. Although votes were cast for each team, no particular group of fans stood out until the Buffalo Bills fans arrived and then took over the competition by posting a commanding lead during the first four months. Then in July of that year, the NY Giants fans caught on and that is when all hell broke loose! As fans began to share tips on how best to gain more votes they also began to devise ways to gain the upper hand. Not satisfied with just voting like everybody else, one vote per page per hour at TemptDestiny.com, a dedicated fan came up with html code that would have people unknowingly vote for the Giants each time they click on a link placed in a message thread - INGENIOUS! This took place in the first year and eventually backfired for the NY Giants fans when other fans caught on and took over the lead. During the experiment, fans posted thousands of their team's Autovote URLs (see right) within their comments at message boards. They even sent hundreds of thousands of emails to people telling them they lost their licence and needed to "click here" to go and reinstate their license only to find that they voted for a football team. As this activity spread over the internet, it eventually became know as the Autovote Virus. Rams fans eventually won the billboard rights for their team for the 2000 NFL season but their team’s playoff loss prevented the 3rd billboard from taking place. The NY Giants returned once again to the Super Bowl that year and for the first time without the Tempt Destiny billboard in place. They went on to lose SB XXXV to the Baltimore Ravens. The turn of events showed that a selection cannot be made without its potential, a selection does not preexist, and the results could not be rigged because no one controls if the team with the most votes would also win the chance to go to the SB, no potential = no selection. In the fifth year I agreed to the terms requested of one of the billboard sponsors that if the team with the most votes did not make it to the SB to offer the choice of the 3rd Tempt Destiny billboard to the Philadelphia Eagles for their SB XXXIX bid. The Eagles did not accept the gift, no selection = no potential. This is where the mechanics/construct of the indirect selection came from. I noticed of the two teams that went to the SB that year, the Eagles had the most votes.The indirect selection option was later incorporated in the last three years of the experiment in order to have complete and unambiguous results. During the 2007 NFL season, Giants fans for the first time since this all began decided to go after their team's billboard legacy. This surge of support came from the NY Giants official message forum toward the end of the season. Prior to their monumental effort, football fans from other teams had mounted a huge lead throughout the year. Keep in mind this was the season of the undefeated New England Patriots who were on the cusp of being the second SB team to have a undefeated season since the 1972 Miami Dolphins. Up until the final hours of the voting competition the Packers fans and Giants fans were neck and neck until the Giants fans pulled ahead in the final moments to cast the most votes (act). Hours later, the underdog NY Giants beat the Green Bay Packers to meet the undefeated New England Patriots in SB XLII (potential). Finally, a direct selection (act paired with one potential) took place. After all these years of conducting the experiment without a direct selection not taken place, this was to be the year I was going to call it quits and was not prepared for the events that followed. I had one week to line up the sponsors, create the artwork, and get the NY Giants approval for the third Tempt Destiny billboard. Since this was not the first time I did this for the NY Giants you would think the acceptance of this gift would have been well received. It was not. Giants fans were constantly emailing me as to the status of the billboard they won for their team and their concerned about the front office's silence about the acceptance of their gift. Unbeknown to the public the third Tempt Destiny billboard almost did not take place. Nonetheless, after seventeen years since the last billboard I finally got my answer. The completion of the third Tempt Destiny painting was not a coincidence. There is indeed such a thing as destiny. By repeating what had been done twice before, I now had evidence that a direct selection would obtain the same results as before. What I did not have evidence of is what would happen if we were to make an indirect selection by selecting more-than-one potential? In the last three years of the experiment if a direct selection did not take place then an indirect selection would be made if one of the two teams (more-than-one potential) that was going to the SB had more votes (act) than the other. After nine years of only having one direct selection event take place, we had three indirect selection events in a row take place (act paired with more-than-one potential). The first indirect selected Tempt Destiny billboard went to the New Orleans Saints. This billboard marked the first time my artwork was displayed digitally at numerous billboard locations in the area. The second indirect selected Tempt Destiny billboard went to the Pittsburgh Steelers (see link). And the third indirect selected Tempt Destiny billboard went to the NY Giants which never saw the light of day. So how does someone who is not a scientist by profession write a science paper about an experiment that includes both cause and effect to those who practice the science of how effects cause effects? This all came down to asking the right question. What are the mechanics involved with how we know what we think we know? Curious enough, I found that this is not a question answered by the practice of science. With my first paper completed, I presented my initial findings at the American Physical Society meeting in Anaheim, California on April 30, 2011. As part of my presentation, I had placed a coin in a cup for the audience to repeat the experiment for confirmation. Months later, my findings were included into the Smithsonian/NASA Astrophysics Data System. This was the twelfth year of the Tempt Destiny experiment. Unfortunately the team with the most votes that year, the San Francisco 49ers, did not make it to the SB. So the third indirect selection of this experiment went to the NY Giants who had the most votes of both SB bound teams. When I notified the NY Giants of their fans winning the billboard in support of their SB quest once more they promptly turned it down and made it poignantly clear that their decision was final. This was the second time the NY Giants turned away this gift and the third time overall since this all began. And so what began with the NY Giants ended with the NY Giants. I cannot help but wonder why is it the NY Giants won the SB each time a selection to support them was made regardless of who made the selection or the manner of how it was made, and why a direct selection was made for the same team out of thirty one other choices. What does this all mean? Have you ever wondered why at the end of all those medical commercials on TV they tell you about the adverse effects of the medicine they are trying to sell you might do to you? If science is suppose to be based on facts then what is going on here? During the summer of 2012, I was in the process of reviewing the data from the Tempt Destiny experiment when the Higgs boson preliminary discovery was announced. 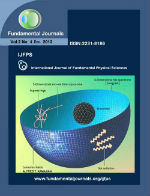 Since my research is fundamental and particle physics is considered to be fundamental as well, I thought their findings would distinguish which selection variables caused the collision effects which caused the decay products used to confirm their discovery. I was wrong. This is when I first came to realize that the methods used in science and the theories it supported were incomplete. I then shared my findings with CERN and the Nobel Committee prior to publishing my findings in a peer-reviewed fundamental physics journal. In 2013 CERN physicists confirmed their own discovery and was awarded a Nobel Prize in October of that year. As a reluctant scientist, I did not seek to discover that the methods used in science to obtain its discoveries were fundamentally flawed. Nor did I seek to find some hidden variables that Albert Einstein was searching for in the final thirty five years of his life. I simply wanted to know if there was such a thing as destiny. What the unequivocal evidence has shown is that the cause of existence, i.e., the universe and everything in it, is not singular since there are two mutually exclusive and jointly exhaustive origin variables in Nature. In this chapter, the ramifications of this discovery are explored. CHAPTER FIFTEEN: Where Do We Go From Here? The evidence has provided a road map of how Nature works regardless of scale. How an elementary particle acts is the same for a human being for we cannot act in violation of the two laws that govern our existence. This means we can use this new insight to bridge the gap between effectual knowledge and its cause. By understanding the mechanics involved, I have come to understand how they link to DNA, climate change, and much more.